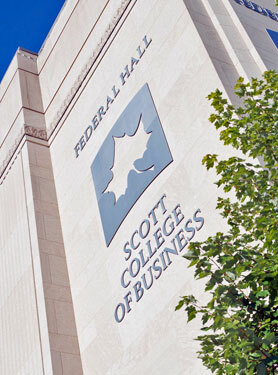 The first-of-its-kind event is aimed at connecting students from Indiana business schools with career opportunities in the financial services industry. Networks Financial Institute at Indiana State University will host the Midwest Financial Services Career Fair on Monday, November 8, from noon to 7 p.m. at the Indiana Convention Center in Indianapolis. The first-of-its-kind conference will bring together students from leading Indiana business schools with financial services career opportunities at firms including banking, professional services, securities and leading corporations. While other high school seniors are stressing over how to pay for college, what college to attend and what to study, two Linton-Stockton High School seniors aren't stressing thanks to an elite scholarship program through Indiana State University. On Thursday, the Networks Financial Institute announced Zachary Goodman and Katie Ladson as Network Scholars. As Network Scholars, Goodman and Ladson will both receive a $20,000 four-year scholarship which will cover tuition and fees and a professional development account valued at $3,000. They will also receive a new, wireless laptop computer, access to at least one paid internship, an international experience, an Indiana State University faculty mentor, an executive mentor during their junior and seniors years and leadership development training and opportunities.